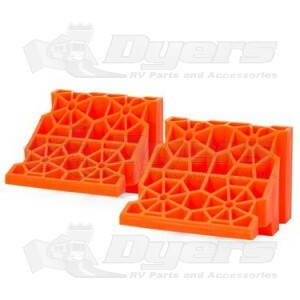 Leveling your RV has never been easier! Now you’ll hit the top of the stack every time. Position your RV in just the right spot when you use the Lynx Stop 'N Chock 2-Pack. Designed for use with Lynx Leveler Leveling Blocks, the set is a self-positioning wheel guide used to situate your RV easily and accurately. These interlocking wheel chocks are made of plastic, and they are simple to put in place. Use these chocks to secure an RV in place so it can be kept there without moving. Enjoy your favorite getaway with confidence with this device. Used for single, dual and tandem wheel applications.